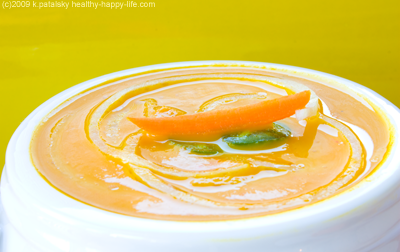 Recipe: Vegan Carrot Ginger Soup, Two Ways! 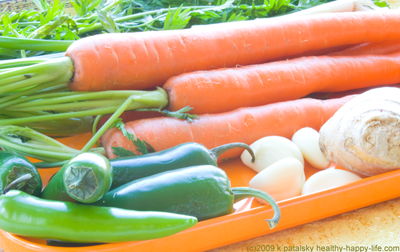 Classic: Fiesta: I recently became a big fan of Carrot Ginger soup. So I spent a few days playing around with flavors and came up with two fantastic vegan recipes. 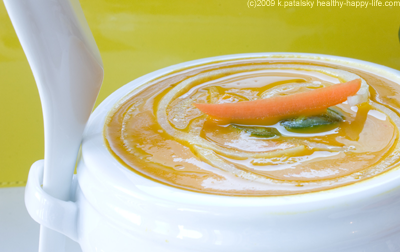 The first recipe is for Classic Vegan Carrot Ginger Soup. Simple flavors that blend together for a spectacular burst of zing! in your mouth. Clean carrot flavor and color. Blended smooth, it has a silky texture. And it's a lot easier to make than you'd guess. 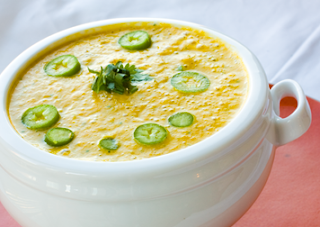 The second recipe is called Fiesta Jalapeno Carrot Ginger Soup. I've put a Mexican spin on the classic recipe. This recipe is BOLD! 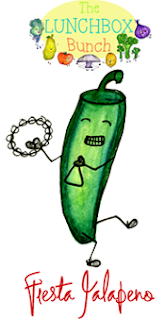 Lots of jalapeno, garlic, ginger and Serrano pepper flavor. Talk about an immunity boosting soup! This one will keep your body healthy and happy. Plus, I've added a secret ingredient that you can add to either of these soups. It adds a sweet flavor (it's not a sweet potato, but that's close!). It also adds 6 grams of fiber and thickens the soup up a bit. tools: blender and soup pot. Heat oil, 2 Tbsp broth, onions, ginger and garlic in soup pan. Saute for a minute or two. Add remaining broth, soy milk, pepper, honey, and carrots. If soup seems too thick, add more broth to adjust consistency. Remove pan from heat. Wait a minute or two for soup to cool. In small batches, about 1 cup each, blend the soup to a thin puree. Blend longer for a creamier soup. I recommend a well blended soup rather than a chunky one for this recipe. Once all the soup is blended, re-pour into soup pan and allow to simmer until it is ready to be served. Re-heating the soup will lead to a thinner, less airy consistency. You may notice some 'air bubbles' in the soup right after the puree. A dollop of veganaise, fresh pepper, fresh shavings of ginger (very thin slices) or a chopped green herb. Dill looks lovely. warning: this soup will make your mouth sweat! The ginger, garlic and peppers are the kicker. For less or more 'heat', adjust the amounts of those ingredients. Heat oil, onions, scallions, and garlic in soup pan. Saute for a minute or two. Add broth, soy milk and the remaining ingredients except the cold bowl ingredients, see below. Cold Bowl: Leave out 1 clove of garlic, 1/2 cup of soy milk, lime juice and the cilantro. Remove pan from heat. Add cold bowl to pan and stir. Wait a minute or two for soup to cool. *Warning: blending soup at a warm to high temperature can cause the blender cap to explode. Make sure your soup has cooled enough and that there is a small air vent at top when blending. Never blend towards your face and always start on the lowest setting. 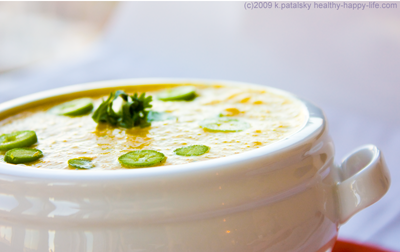 In small batches, about 1 cup each, blend the soup to a thin puree. Blend longer for a creamier soup. Once all the soup is blended, serve immediately or re-pour into soup pan and allow to simmer until it is ready to be served. Re-heating the soup will lead to a thinner, less airy consistency. You may notice some 'air bubbles' in the soup right after the puree. Serve with a garnish of fresh chopped cilantro and Serrano or jalapeno pepper rounds thinly sliced. A fresh thinly sliced sheet of ginger is also nice because it brings out the ginger smell. 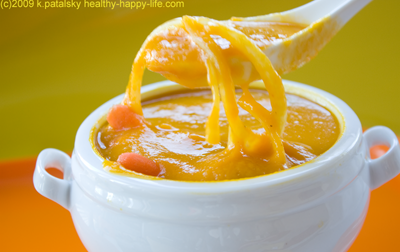 One of my favorite secret ingredients to add to this soup is a fresh ripe persimmon. It makes the soup a lot thicker and adds fiber and a hint of sweetness. Simply blend the persimmon, skin and all-remove the leaves, into the soup after it has been fully pureed. No need to heat or cook the already soft persimmon.